It is the chronicler's duty not only to report on the beautiful things in life. The Vogelmord in Cyprus is in stark contrast to what the beautiful pictures show about the migratory birds on the island. Sustainable tourism with bird and nature friends is unfortunately not in the interests of those responsible in politics and business. An estimated 2.5 million birds die every year in Cyprus as a result of the catching in nets or on so-called sticky "lime sticks", far more than in all other European countries. Strictly forbidden in accordance with the laws of the European Union, there is a lack of political will to combat this organised crime. 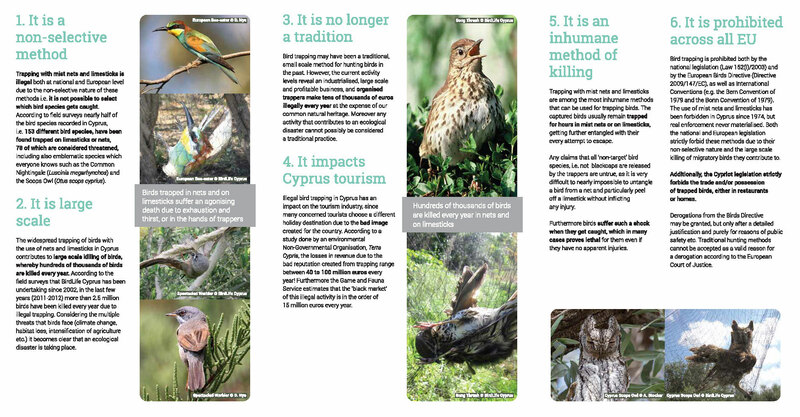 Large sums of donations and taxpayers ' money are spent in Europe for the preservation of many species of birds and nature, while at the same time on the island a crime of nature worth 15 million euros annually under the guise of "Cyprus tradition" from politics to Of voters is openly supported. The European Commission has not taken any effective steps to this end except for warnings to the Government in Cyprus.